As Americans, we have a love affair with fried food. Whether it’s french fries or fried chicken, we love food dipped in grease and cooked to golden brown perfection. However, as with all good things, there is a downside to this obsession, which, of course, is the negative nutritional value. Too much fat in our diets are turning us obese and out of shape. So how can we indulge in our favorite foods without destroying our waistline? Luckily, there may be an answer that isn’t the standard “diet and exercise” we have too frequently heard. It’s called an Air Fryer, and it allows you to cook fried foods without the guilt of drowning everything in fat. Today I’ll show you one of the best Black and Decker Air Fryers out there, as well as show you how the system works. It can kind of be hard to believe that you can fry foods with just hot air instead of oil. However, when you get down to what constitutes a “fried” food, it is just a matter of crispiness. The difference between fried chicken and baked chicken is the layer of breading and skin, and the difference between French fries and regular potatoes is the shape and crispiness of the outside. That being said, an air fryer uses circulating hot air to cook the food and develop a crispy exterior, thanks to something called the Maillard Effect. The Maillard Effect is a somewhat complicated procedure but put in lay terms it refers to the effect of browning that occurs on the outside of your food. Once food is heated rapidly on the outside, it crisps and browns due to a reaction of the particles within. 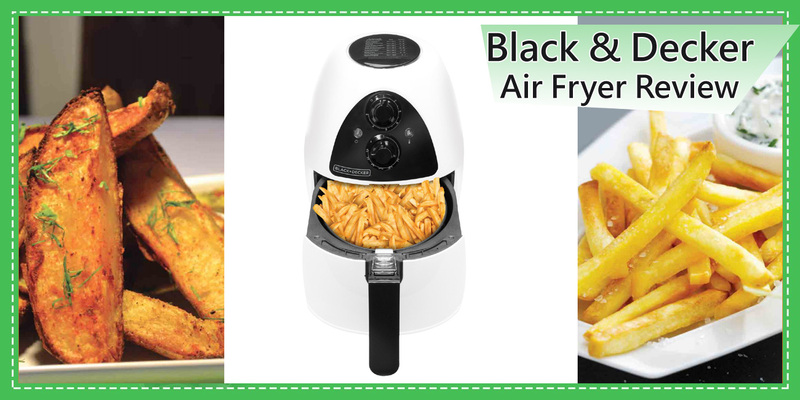 Simply put, an air fryer crisps your foods by using hot air instead of cooking oil. Why would you use an air fryer? Q. How long does it take to cook? A. For fries, it can take up to 20 minutes, depending on if they are frozen and how many you are cooking. For meats, it can be as little as ten to fifteen minutes, again, depending on the variables, such as the amount of food and cooking temperature. Q. If you fill the fryer completely, will everything cook evenly? A. Unfortunately if you fill the basket, you will have to pull it out every five or six minutes to stir everything to get an even cook on all sides. Q. Is there any plastic inside this device? A. No, all materials that touch your food are made of non-stick metal. No plastic will leach into your food. Overall, the Black+Decker PuriFry is an excellent device for anyone looking to cut down on fat and calories. My only real complaint is that the basket could be larger to accommodate more food (I like to host parties regularly), but I seem to find that problem with both air and deep fryers, so I guess it’s not a proprietary problem. Another issue I have is the fact that you have to stir your food to get an even cook. That is not something I have to worry about with a deep fryer, but the tradeoff is less mess and fewer calories, so it’s ultimately worth it in the long run. Also, if you are a fried food fanatic like I am, you may miss the grease that comes with a batch of chicken wings at first, but after a few times, you hardly miss it at all.